Birders converged on the Culp Christmas Bird Count Circle in Blair County on a cold and windy December 19, 2015 to participate in the 47th Christmas Bird Count (CBC) sponsored by Juniata Valley Audubon Society, under the direction of National Audubon. 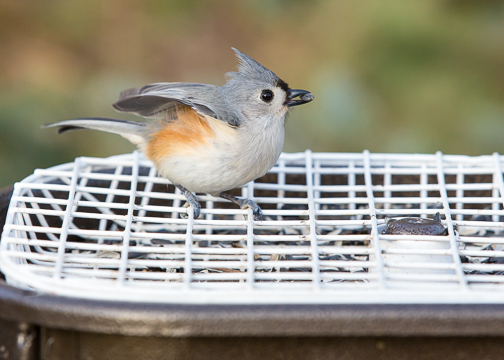 Many song birds, such as this Tufted Titmouse, prefer black oil sunflowers. These seeds are high in fat, providing much-needed energy during the winter. Birders converged on the Culp Christmas Bird Count Circle in Blair County on a cold and windy December 19, 2015 to participate in the 47th Christmas Bird Count (CBC) sponsored by Juniata Valley Audubon Society, under the direction of National Audubon. The first CBC ever was in 1900 - an alternative activity to count birds ALIVE, since prior to 1900 the tools of choice were not binoculars, but were guns, with participants competing to see how many birds they could KILL. Some key counters were sorely missed as they could not participate this year due to illness, but the 18 people who did participate on December 19 counted a total of 5,082 birds, representing 67 different species. JVAS President and CBC Compiler Laura Jackson would like to thank the following counters who braved a cold and windy day: Susan Braun, Michael David, JP Dibert, Carl Engstrom, Kurt Engstrom, Stephanie Gallagher, Debra Grim, Charlie Hoyer, Mike Jackson, Kristin Joivell, George Mahon, Stephen Martynuska, Ian McGregor, John Orr, Mark Shields, and Jody Wallace. JVAS VP Mark Bonta helped to organize the counters and contributed the sighting of a Horned Grebe that was recorded as a “count week bird,” making 68 the total number of species recorded during the count week. Mild fall weather meant that there was plenty of open water, but waterfowl were surprisingly scarce. Canoe Lake is a good location to observe waterfowl, but no Canada geese were to be found. Observers did find 10 Buffleheads, one Common Goldeneye, seven Hooded Mergansers, and one Common Merganser, as well as a few Mallards, at Canoe Lake. Elsewhere in the count circle, 143 Canada Geese were found, just two Wood Ducks, one American Black Duck, and over 200 Mallards. Fortunately, the 10 American Coots spotted at Canoe Lake were alive - last year approximately 12 were found dead floating in the lake. The reason for their death remains a mystery. 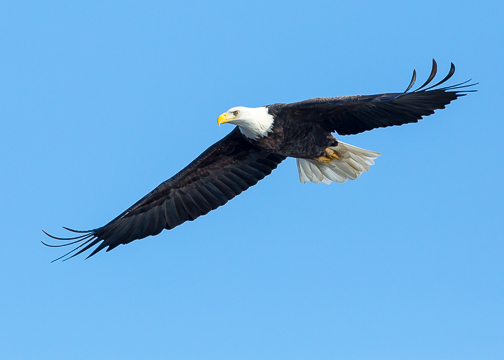 Counters spotted 5 Bald Eagles this year - a record high for the Culp CBC Circle; Bald Eagles were rarely seen during the Christmas Bird Count until recently. Reintroduction efforts by the Pennsylvania Game Commission are so successful that Bald Eagles are actually nesting in Blair County. It was a good day for raptors: 5 Bald Eagles and 1 Golden Eagle were counted, as well as 1 Merlin, 3 Northern Harriers, 7 American Kestrels, 4 Sharp-shinned Hawks, and 6 Cooper’s Hawks. As expected, Red-tailed Hawks were the most common - 28 were found. The highlight of the raptor survey was finding a Northern Goshawk. Sinking Valley, with its broad vistas and farm fields, is a good habitat for birds of prey, as well as for the gallinaceous birds like Wild turkey (48), Ring-necked Pheasant (16), and some exotic Chukar (7) - a partridge native to Eurasia that has been introduced as a game bird. Sadly, our state bird, the Ruffed Grouse, is in decline, and only one was found. Another species that frequents Sinking Valley in the winter is the Horned Lark - 70 were counted. All species of woodpeckers were observed, except the Red-headed Woodpecker; European Starlings are responsible for their absence. In fact, the Starling was the most common species counted in the circle, with observers reporting a total of 1,714 birds. Brown-headed Cowbirds were the second most common bird with 550 reported. A few Red-winged Blackbirds (8) and just one rusty Blackbird were found in some of the Cowbird flocks. Many common “winter birds” were seen: Winter Wrens (2), Golden-crowned Kinglets (16), American Tree Sparrows (40), Dark-eyed Juncos (265), White-throated Sparrows (120), Purple Finches (7) and a few Pine Siskins (7), to name a few. The relatively mild winter meant that many birds which might be scarce during cold winters were still in abundance: 53 Eastern Bluebirds, 50 American Robins, 7 Northern Mockingbirds, and 24 Killdeer. Observers at feeders and along wooded trails also reported good numbers of our common backyard birds: 76 Black-capped Chickadees, 81 Tufted Titmouse, 50 White-breasted Nuthatches, and 7 Carolina Wrens. It is a challenge to thoroughly cover the count circle, centered at Culp - a crossroads in Sinking Valley. The circle is 15 miles in diameter, so the effort includes observations while driving the roads, hiking the fields and forests, or counting birds at backyard feeders. This year, 18 birders counted throughout the day, from dawn to dark - and even after dark for owls, for a cumulative effort of 75 hours looking for birds. The Culp CBC is usually held the Saturday before Christmas, so if you might like to participate next year, call JVAS President Laura Jackson (814-652-9268) and get your name added to the list of potential participants. If you live in the count circle, you could count birds at your feeder. Otherwise, expect to spend part of a day on an exciting adventure exploring parts of Blair County. A Christmas Bird Count Dinner was held immediately following the count when most of the birders enjoyed an evening at Marzoni’s - after a great meal each group reported their findings at the “tally rally.” A good day was had by all! A complete list of all the bird species counted for the Culp CBC can be found on the National Audubon website.